If you are looking for a proven BlueHost reliability and superb services and want to host unlimited websites than this is the best option! Hostmonster is a BlueHost brand. It was founded in 1999, but it has been actively been in business from January 2006. So what is the difference between BlueHost And Hostmonster? They have a little different Control Panel. Hostmonsters is a little easier to use, interface is more beginner friendly. They now both offer users to host unlimited websites with 300Gb space, 3000 Gb bandwidth. Everything else is very similar to BlueHost. Support is excellent and so is the package. BlueHost is one of the fastest growing Hosting Companies in the world. They operate more than 200.000 hosting accounts and their services are excellent! They have started their business in 2003, but their CEO, Matt Heaton has been in hosting business since 1996, so they know what they are doing. The best thing is they listen to their customers! Some users on forum were talking how nice it would be to have some extra features with their hosting account and after I while, everyone were upgraded with this feature! So they really care for you as their customer. Ok here are the features: 300 Gb Hosting Space, Free Domain Name, Host unlimited domains on 1 Account, 2,500 POP Email Accounts, 3,000 GIGS of Transfer, 50 mySQL databases, Free Fantastico, 24/7 Superb/Responsive Sales/Support, 2003 Front Page Extensions, Free Site Builder, Joomla Autoinstall, WordPress Autoinstall – Bluehost is recommended as No.1 Registrar by WordPress.org. You can also pay by paypal. These are generic Top Level Domains. Some of them need special credentials to be registered. .aero domain is reserved for members of the air-transport industry and cannot be registered by anyone. .cat domain is reserved for the Catalan linguistic and cultural community. .com domain is intended for commercial organizations and can be registered by anyone. It is also the most popular topl level domain name in the world. You can register it right now . .coop domain is a tld for cooperative associations. Not very common. .info domain is open for everyone to register and is meant to be for informational websites. .jobs domain is designed jobs companies and for human resource managers. .museum domain is restricted only for museums. .name domain is reserved for individuals that want to establish their name as a brand. It can be freely registered here. .net domain is also a popular tld and can be registered by anyone. It is inteded for entities connected with networks, networking. .org domain is tld of organizations around the world. It is designed for the noncommercial community, but can be registered by anyone. .pro domain is restricted to professionals: doctors, attorneys. Applicant has to provide credentials in order to register. .travel domain is reserved for travel related entities and cannot be registered by anyone. .gov domain cannot be registered by public. It is exclusive for the United States Government. .edu domain is reserved for US educational institutions. .mil domain cannot be registered by public. It is reserved for the needs of the United States Military. .int domain is used strictly by organizations endorsed by international treaties between governments. International Domain names are sometimes referred as country codes or contry-code domain extensions. We buy them from www.GoDaddy.com or Dotster.com. .vi – Virgin Islands, U.S.
Go global! Register a country-specific domain name. International domain names can be registered by citizen of the territory for which they are intended, but there are some exceptions which can be registered by anyone. Online builders are the easiest way to create a basic website in less than 30 minutes. There is lots of Online Builders. Here are links to Online Web Builder Demo Accounts and links to Instructions on how to use them. Check them out before you sign up for web hosting so you will know exactly what is waiting in the package you buy. BlueHost and Hostmonster use PageWizard as their online builder. Ipower uses Vdecks integrated Online Web Builder. Ix Web Hosting uses Site Studio as their Online Builder. 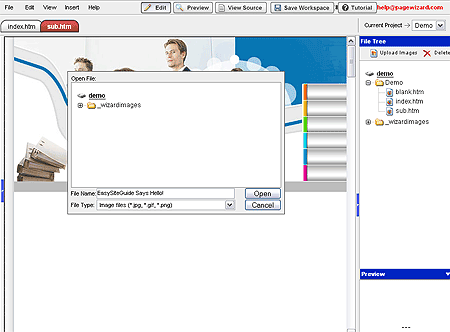 Lunarpages uses Soholaunch Online Builder. AN Hosting provides their users RVSite Builder. Midpase uses Site Studio for their Online Builder. 1&1 uses their own Online Builder. HostGator uses Site Studio for their Online Builder. If you like any of the Hosts above and want to find out more about them, check our Best Hosting Page. If you sign up with any of these hosts trough our site, some hosts will pay a portion of fee back to us. Thank you for supporting EasySiteGuide! Free hosting – is what the name says! Means that you don’t have to pay any money for hosting services. In practice it is not a very good option, I have been disappointed many, many, many, many times. But people just cant resist when something is free. Wrong! If you want a personal blog where you will just occasionally post some of your thoughts than go to Blogger . Its great! And its free! For everything else, especially for business get yourself a decent hosting provider. Look at our Best Hosts if you don’t have a clue what to choose. Means you share your files with other sites on the same server. This is extremely popular hosting type, since it is very affordable. You get your account packed with lots of space and bandwidth most users will never use. I have several shared hosting accounts for my websites and I recommend you to get yourself one of these . Now if you want to make money in hosting industry, than Reseller hosting is just for you! You can start easily and with no costs. Just apply and set up a web host under your own brand, pricing structure and everything else. You will be provided with everything you will need and the money is also very good! If you plan to have lots of domain names you should get yourself a Virtual Private Server – it is a extremely good deal, because Virtual Server is almost like a real one. Virtual means that you split hardware with other users on the same machine, and that cuts the operating costs. That way you get everything you need for a price just a bit higher than shared hosting. Oh, did I mention you can install your own software, scripts and stuff. However, if you don’t know what is root access, Apache or MySQL you should rather start with shared hosting. Ah, that is a Dream of every Web master who starts doing business. Dedicated means that the whole server – machine – is reserved for 1 and only 1 website. Here is the deal: web hosts rents you one computer, software and a high speed Internet connection that is fast like a lightning. Dedicated servers hosting is the most powerful and most complex hosting. If your site receives a huge amount of traffic every day, you should get one of these. There is one drawback with dedicated hosting. If you are not a computer geek it could be hard to manage it. And that is exactly why hosting providers now offer Managed hosting – an expanded dedicated server hosting. Where with dedicated server you had to control the server 24/7, with managed hosting – the provider does that. So it is like a regular dedicated hosting with maintenance and monitoring 24 hours a day, 7 days a week. There is one other type of hosting which is not so common, but is pretty cool for clients who have lots of websites. It is called Colocation. It is a type of hosting where you bring your machine to a hosts data center. You are in total control of the server all the time. And the hosting company rents you rack space, high speed connection to Internet backbone, environment suitable for servers ( controlled air temperature, security, redundancy) and IT staff available for help. Now that is it for regular websites. But what hosting types use the biggest sites and the sites with traffic of several thousands users an hour? I always knew there was something more…And there is! It is called Clustered hosting – This is a hosting type with lots of dedicated servers bonded together. It can be a minimum of 2 and up to several hundred servers and more (I believe Google has about 450.000 servers around the globe).Clustered means that the same page or service is served on multiple servers (often called mirrors). This enables high redundancy and great access speeds on different continents. Well if you are lucky enough to host a clustered website let me know! If you are not sure which hosting is right for you, don’t worry! Go to our Hosting Wizard and discover which host suits you best! If you still cant decide send us an email with your details. We will help you!